Last week I discussed why defining the individual is so difficult. Having put you in an existential crisis over whether or not you are an individual, it is time to pick up the pieces and see if we can come up with a useful phenotypically based definition of an individual. At the very least perhaps I can help you decide whether or not you need to buy an extra bus ticket, one for you one for your symbionts, or whether one bus ticket is enough. So, what is an individual? It turns out that a big hint comes from contextual analysis. Who would have thought that a statistical technique that is frankly just multiple regression could provide answers to philosophical questions! To remind you, contextual analysis is a method of analyzing multilevel selection. Using this method the fitness of an individual is measured, as well as a set of traits measured on the individual and on the group (or neighborhood, or kin group etc) that they belong to. A multiple regression is then done, and if there is a significant partial regression of individual fitness on a group level trait we say that group selection is acting. This makes sense because a significant regression implies (taking all of the appropriate caveats into account) that the fitness of an individual is a function of the group to which they belong. Here is point number 1: in contextual analysis fitness can only be assigned at one level. It is measured by the investigator, and the level at which they measure fitness is a function of what is possible, and on the investigator’s understanding of biology. Thus, if you want to see if there is selection for running speed in cheetahs it makes sense to measure and assign fitness at the level of the whole organism. You could assign it at the level of the cell, but it would be a waste of time (who wants to measure the fitness of a trillion cells?). On the other hand, you could measure it at the level of the population of cheetahs, but from our understanding of biology, we would be inclined to decide that this would not be terribly helpful. Thus, logically, it makes sense to assign fitness at the level of the organism. I will make the interesting point that in this case the “organism” is actually a multi-species assemblage that collectively hurtles through space trying to catch gazelles. Point number 2: Nature changes as nature changes. That is, change in groups occurs at all levels at all times. Cells in our bodies are produced by mitosis, and lost through cell death, organisms live and die, populations are founded and go extinct, as do communities, species, ecosystems, and presumably planets. Every one of these may cause a change in the distribution of their appropriate population. That is, if you drink a lot of alcohol perhaps some liver cells die. This is a change in the distribution of cell types in your body. 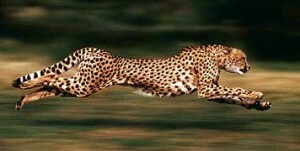 If some cheetahs run to slow perhaps they starve, this can result in a change in the distribution of running speed in the cheetah population. In the first situation case we are inclined to call the decrease in the proportion of liver cells as development (or perhaps stupidity), in the second situation we would be inclined to call the change in running speed evolution. I would argue that both cases are qualitatively similar, however the difference is that we intuitively assign fitness at the level of the organism. Because we assign fitness at that level there can be variation among organisms in fitness, and since there is variation in fitness among organisms and we can speak of changes in running speed in terms of evolution. In contrast, in the case of the case of the liver cells, since we intuitively assign fitness at the level of the organism speaking of the fitness of cells within that organism makes no sense. Thus, we have to call differential death and proliferation of cells by another name, such a “development”. The point is that there is no qualitative difference from nature’s perspective between these two scenarios, but there IS a qualitative difference in our interpretation of these two scenarios. The difference is that in the case of the liver cells we are speaking of a process taking place at a level below that which we assign fitness, and thus call it development, whereas in the second it is above the level at which we assign fitness, and thus we an call it evolution. So, this gives us a very simple and unsatisfying definition of what an individual is: An individual is the level at which we assign fitness. So, to consider the examples I talked about last week. For an aspen stand, is the individual the clone or the tree? For identical twins are they one or two individuals? Based on my argument, the answer is you decide. There are a couple of interesting points about this idea. The first is that this explains why we have so much trouble defining the individual. The definition I gave suggests that from a very fundamental perspective what an individual is is an arbitrary construct of how we view nature. It is not a natural unit any more than any other part of nature is (remember Mayr arguing that the species is the only natural unit in phylogenetics?). The more interesting point is that in almost every case, probably every case for metazoans, what we call an “individual” is typically a multi-species assemblage. In other words, not only is the individual an arbitrary construct, it is not even a single organism, if you define “organism” as a colony of cells derived from a single fertilized egg. Next week I will expand on this definition of the individual, and hopefully make it a little less arbitrary. 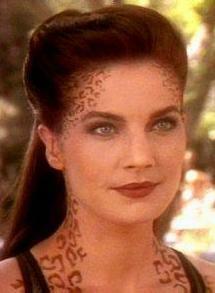 Nevertheless, I do stand by this as a perfectly valid definition of the individual, oh and Jadzia Dax should be fine buying only one bus ticket. This entry was posted on Wednesday, September 17th, 2014 at 11:32 am and is filed under Uncategorized. You can follow any responses to this entry through the RSS 2.0 feed. You can leave a response, or trackback from your own site. This post is based on a chapter of mine in Bouchard and Huneman’s book “From Groups to Individuals”. That chapter is were I first came up with the comparison between sickness and laziness. Just wanted to say that after finding and re-reading these posts, I found them just as interesting. Thank you! P.S. I particularly enjoyed the comparison between “sick” and “lazy” in part 1.